[BRIDGEVIEW, IL, March 2019] With Venezuela facing economic and political collapse, more than 1 million Venezuelans have crossed into Colombia, fleeing widespread food and medicine shortages and rampant hyperinflation. Colombian border towns, like Cucuta, are now flooded with Venezuelan refugees awaiting humanitarian aid. Over the course of the past week, Zakat Foundation of America’s staff and volunteers packed emergency aid to be delivered to those in need on the Venezuelan border. The Zakat Foundation staff worked together earlier today to load thousands of pounds’ worth of relief kits. With winter approaching in Colombia, the shipment contained thousands of blankets, diapers, towels, clothes, and other winter necessities. The container will be distributed through Zakat Foundation’s local partner, Casa de Paso La Divina Providencia, a facility housed within the compound of St. Peter the Apostle Catholic Church in Cucuta, Colombia. On behalf of local Venezuelan communities, Claudia Martinez Patino, an activist and student in Christian ministry and nonprofit administration, arrived at Zakat Foundation’s Chicagoland headquarters this morning to help load the emergency aid. Having been born and raised in Colombia, this issue was one close to her heart. “Colombians themselves will share whatever they have,” said Martinez Patino, who visited Colombia just two weeks ago. “It’s in our culture. We just share whatever we have and we want to open our doors to everybody. 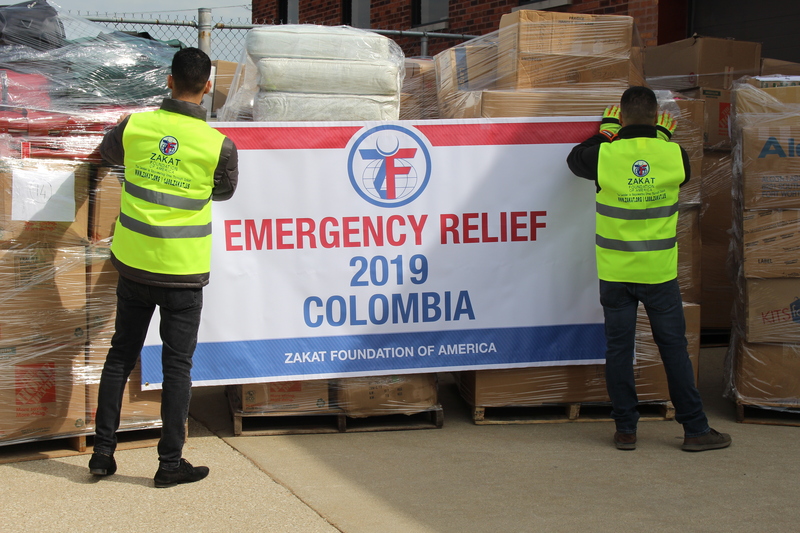 Zakat Foundation of America has been delivering aid in Colombia since 2018. The organization has identified firsthand malnutrition as Venezuelan refugees’ greatest problem and has helped feed 500 displaced persons a day, additionally supplying special nutrition kits to children and expectant mothers.